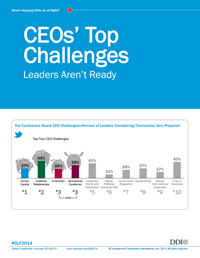 How ready are your leaders to overcome CEO's top challenges? According to a Conference Board Survey, CEO's top Challenges are: Human Capital, Customer Relationships, Innovation, Operational Excellence, and Global Expansion. Are they ready now, ready with development, or not ready at this time? 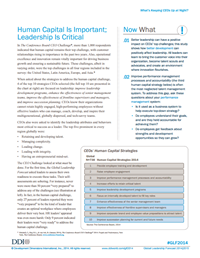 Along with your quiz results you'll receive a copy of the CEOs' Top Challenges research. Do your leaders ensure effective execution of key processes that will drive efficiency by aligning communication, people, culture, and processes? Do your leaders analyze information, generate alternatives, and make recommendations to enhance operational effectiveness? Do your leaders implement change initiatives to encourage new, more efficient processes? Do your leaders build and lead an engaged team that is committed to the organization and its bottom line? Do your leaders plan and support the development of individuals so they can improve their current or future performance? Do your leaders provide timely guidance and feedback to help others strengthen knowledge or skills? Do your leaders build long-term customer relationships by meeting their needs or exceeding expectations? 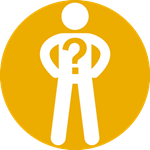 Do your leaders gain customers’ confidence by being honest and consistent, keeping commitments, exchanging ideas openly, and providing support? Do your leaders create value for the customer by creating solutions that drive long-term business impact? Do your leaders encourage the initiation, implementation, and acceptance of product or process innovations? Do your leaders communicate and model a vision for innovation in a way that motivates others to take action? Do your leaders analyze information, generate alternatives, and commit to decisions that drive innovation? Do your leaders understand the competitive global environment and trends that impact expansion into foreign markets? Do your leaders capitalize on cross-cultural experiences to enhance their ability to operate in multi-cultural environments? Do your leaders actively seek cross-cultural learning opportunities and take risks to enhance global knowledge and skills? What is your CEO's top challenge? Almost done! Complete this short form to see how your company rates against our global benchmarks and get a copy of the research.